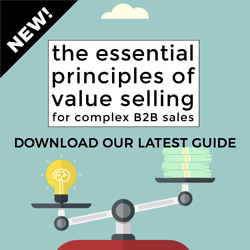 The idea that complex B2B buying decisions inevitably involve multiple stakeholders is widely acknowledged, even if the number of actively engaged decision makers can sometimes catch sales people unawares. 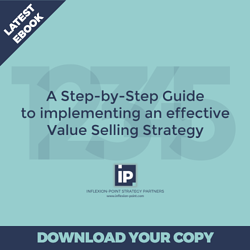 The authors of “The Challenger Customer” now reckon that an average of 6.8 stakeholders are actively involved in the typical high-value buying decision process - and point out that the number can easily rise into double figures. 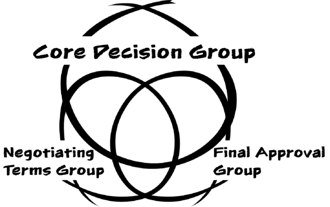 The first group is the obvious one - the core buying decision group. This is the group of people who collectively determine the need for change, define their vision of a solution, identify and evaluate potential solutions, and select their preferred option. This buying decision group often includes key functional executives, managers and users, financial executives, technical experts and gatekeepers representing departments like IT. This is the group that most of us recognise we need to target and engage in our sales process. 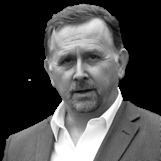 Given that it can be challenging to deal with them all individually, many of us recognise the value in identifying a change agent who can help to bring the different stakeholders together and drive the consensus-building process. Getting this group to select us as their preferred vendor, and eliminating all other alternative options, is a necessary but sometimes not yet sufficient condition for winning the sale. This is because in many complex buying decisions there are two additional stakeholder groups that tend to get involved, and whose support is critical to our ultimate success. These additional stakeholder groups are the negotiating terms group and the final approval group. These groups are not mutually exclusive to the core buying decision group, and there are often overlaps between the memberships of these three groups, but we should not assume that they are all obvious members of the initial buying decision group. The negotiating terms group often includes procurement and legal specialists who were not necessarily contributors to the initial selection process. Their role is to protect the customer’s interests and ensure that they secure the best possible commercial and legal terms. The level of influence wielded by this group depends on the balance of power between procurement on the one side and the operation functions that have the business problem on the other, but sometimes have the ability to block or delay the negotiating process. It’s critically important that we understand how this negotiating terms group is measured and motivated - for example, is the performance of procurement solely evaluated on the level of discount achieved? - and what their relationship with the core buying decision group is like. The last group - the final approval group - certainly has the power and ability to completely derail a project that otherwise has the full support of the buying decision group. This is because they have a much wider perspective than the specific issue that our solution is intended to address. Even if a budget has notionally been allocated to our project, the final approval group can still decide not to allow the project to proceed. This is because they are responsible for balancing all the various claims from all of the other possible projects that are competing for a finite amount of investment and management attention. They are also responsible for enforcing high-level company strategy. For example, they may have been persuaded by a major IT vendor that they should adopt their single suite solution - even though the operating departments desperately want to use a more capable best-of-breed specialist approach. In order to satisfy this final approval group, our sponsors must not only ensure that there is a strong business case and ROI for our project, they also have to demonstrate that the project satisfies company strategy and deserves a higher priority than at least some of the other competing projects. I’ve seen many apparently “in the bag” sales fall at this critical final hurdle. And it’s particularly galling that in the final analysis our competition isn’t always another vendor but a completely different way of investing the customer’s resources.